Thomas Mapfumo, 'Lion Of Zimbabwe,' Returns From Exile With Triumphant Homecoming : The Record Mapfumo performed a homecoming show in the country last month, after spending over a decade-and-a-half in self-imposed exile. 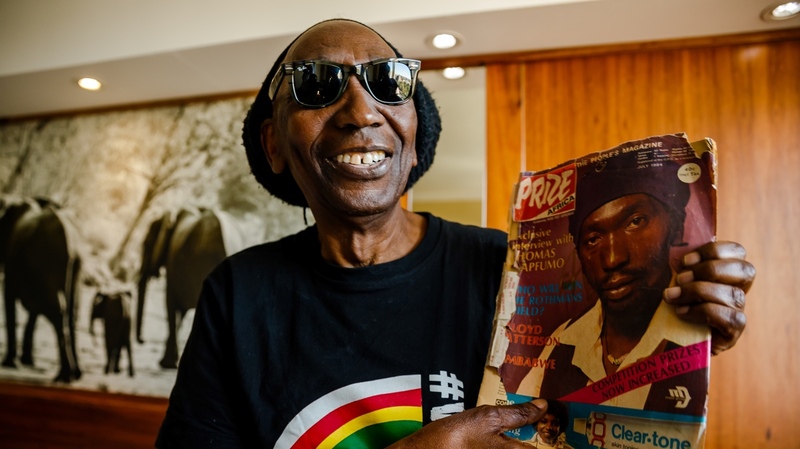 Thomas Mapfumo, holding a copy of a July 1984 edition of a magazine featuring his cover story. After 18 years in self-imposed exile, one of Zimbabwe's most popular and outspoken musicians, has returned home. 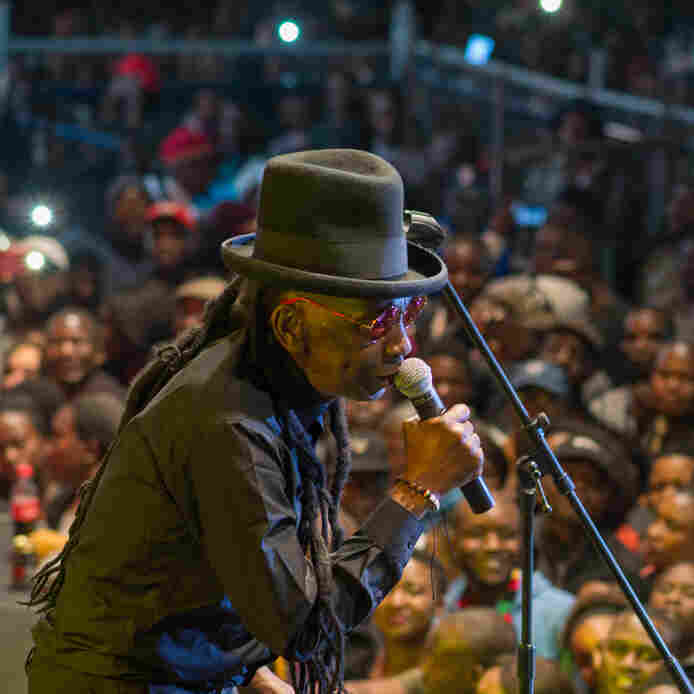 After a 14-year absence, Thomas Mapfumo and The Blacks Unlimited rocked until dawn at Glamis Arena, an open-air stadium packed with some 20,000 fans of three generations. Mapfumo — Mukanya to his fans, a reference to his totem, the baboon — moved his family out of the country in 2000, to escape turmoil and harassment under the regime of Robert Mugabe. Mugabe and members of his ZANU-PF party were frequent targets in Mapfumo's barbed songs and public statements. But since Mugabe's military-enabled ouster last November, efforts have been underway to get Mapfumo back to the country and in front of the audience that loves him most. In Harare, Zimbabwe, on Saturday, April 28, it happened. "I thought maybe I wasn't going to be able to come back here while I was still alive," mused Mapfumo the day before the big show. "But by the grace of God, I'm here." Mapfumo last performed in Zimbabwe in April, 2004. For fans of an artist who once prowled the stages of Harare four or five nights a week, it's been a long dry spell. In the meantime, a whole generation of Zimbabweans has come of age knowing his music mostly from their parents' CD players and in public transport vans, or kombies. But it was clear from advance ticket sales that the interest in this historic concert was intense. Mapfumo pulled together an all-Zimbabwean ensemble of 17 musicians and dancers, coming from Zimbabwe, South Africa, U.K. and his current home in Oregon. Over two days, the band rehearsed songs from throughout Mapfumo's 40-year repertoire. During his self-exile, Mapfumo has performed in the U.S., the U.K., Canada, Mozambique and South Africa, working with a skeleton crew from Oregon and musicians he knows in these locations. Bands have rarely exceeded eight musicians. So this virtual orchestra felt like a return to The Blacks Unlimited glory days of the late '80s and '90s. There were a few old-timers in the lineup for this show, but mostly the band was made up of much younger musicians. "It's so weird," Mapfumo notes with a laugh. "You start thinking of the old guys and now you see all these new faces. Those are our daughters. But they know the music." A return show for Mapfumo has been rumored so many times that it had become hard to believe it would actually happen — and there were hitches that might have derailed even this one. Late advance payments from the promoters, rumors that Mugabe money was behind the show (unfounded) and squabbles over filming rights — as the band took the stage for sound check, it felt a bit dream-like, even to its members. "I keep on pinching myself. 'Is this real?,'" says lead guitarist Gilbert Zvamaida, who has spent years in exile with Mapfumo in Oregon. "I was excited at the rehearsal, now this is the real thing, I'm kind of nervous. I'm a perfectionist by nature." That shows. Zvamaida's entrancing interplay with former Blacks Unlimited guitarist Zivai Guveya, now based in the U.K., was a treat to behold throughout the rehearsals and the concert. 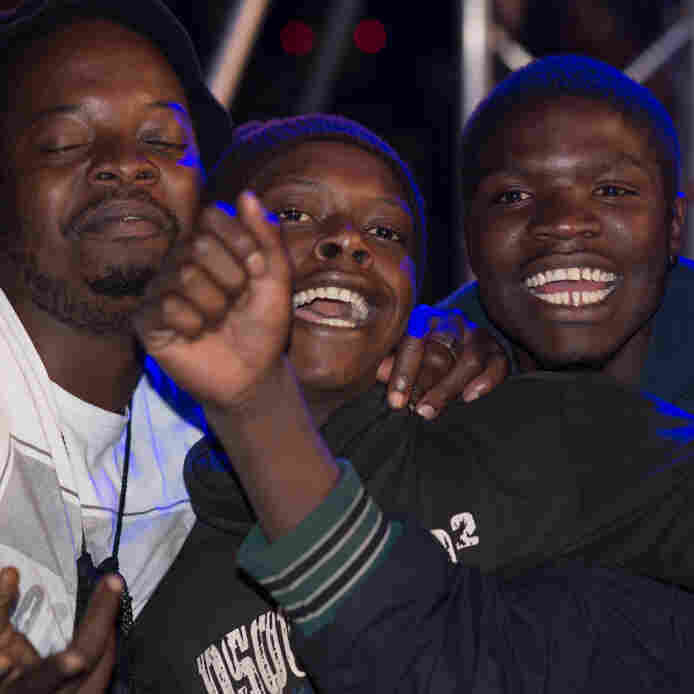 The music began soon after dark, with sets by four opening acts, including another veteran of Zimbabwe music, Oliver Mtukudzi, and Winky D, one of the top acts in Zim-Dancehall, the country's dominant youth genre these days. Just after 2 a.m., The Blacks Unlimited took the stage. The mood was electric. Mapfumo appeared in a black suit, orange-tinted glasses, and a quasi-top hat, behind which his three-foot dreadlocks trailed down his back. "Zimbabwe!" he crowed to roars of adulation. The artist hardly spoke as he led the band through a no-nonsense set, full of lengthy renditions of classic and new songs. At times the crowd sang along, ecstatic. At one point, Oliver Mtukudzi came on stage and danced with the band, to Mapfumo's evident delight. Fans had often cast these two as rivals. But in fact, they have long been good friends, and this public showing of mutual admiration went down well with the crowd, perhaps a sign of what they'd like to see from their squabbling politicians. The show ended only when the sky began to lighten. Some had wondered whether 72-year-old Mukanya still had that kind of stamina. But this and all other doubts were put to rest. 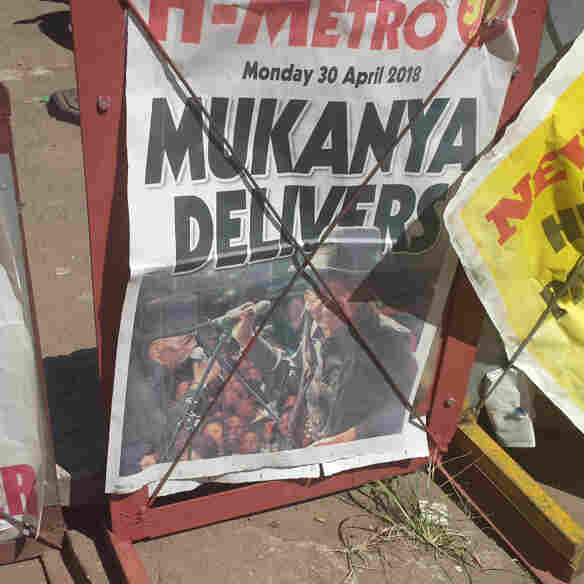 The Monday morning papers contained raves, summarized in the headline "Mukanya Delivers." "It was magnificent," noted longtime Zimbabwean music writer Fred Zindi. "We had not seen Thomas in Zimbabwe for almost 15 years, and suddenly he comes with the same bang he had in the '80s and the '90s. That was really cool. The biggest show I've seen compared to last night's one was Paul Simon and before that, Bob Marley. Bob Marley was a free show, and the crowd was almost the same as last night — and last night, people were paying $20 minimum." Particularly encouraging was the preponderance of young fans in the crowd. These are the people Mapfumo wants to see lead the country, and the sooner the better. "For 37 years, we have failed," said Mapfumo referring to his generation writ large. "When we started, I was a young man, but now I'm seventy years old, and we haven't done anything to improve our situation. So I'm asking them politely: Give the youth of today the chance to run the country." The young crowd that showed up in numbers for this show included many who had never experienced a live Mapfumo show. During the past 14 years, state-supervised radio stations have played his music only selectively, and state press has gone out of its way to paint the artist as a misguided has-been. So why this big youth turnout? One of Mapfumo's former managers, Cuthbert Chiromo, has an answer. "When you're growing up, you've got your brother or your uncle or whoever, and you're exposed to what they are listening to. At home, obviously, the king in the house, he's playing Thomas Mapfumo," Chiromo says. Indeed, many young fans in the crowd told stories of being influenced by their Mapfumo-obsessed older relatives. It seems that the songs themselves, with their rich blend of tradition and modernity, and their trenchant lyrics, are central to Mapfumo's staying power over his extended absence from the country. One of the organizers, Blessing Evanvavas, seemed awed by what he and the young promoters of the show had achieved. "Just him coming to Zimbabwe, it was a very big political statement. It silenced a lot of critics, and it changed a lot of dynamics in the political circles in this country." Mapfumo himself was deeply gratified to sing again in his homeland. "All I would like to say is I would like to thank everyone who supported me yesterday and those who are still supporting me today," he told the crowd, "I'm not fighting to be a leader of this country, but I want to stand with the poor people. That's where I belong. My message is still the same. It hasn't changed."